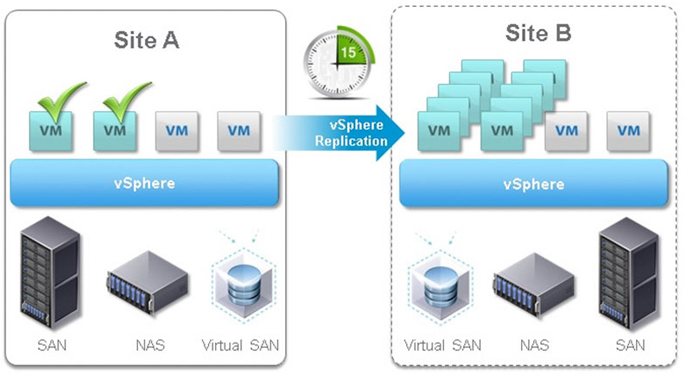 VMware vSphere Replication is a hypervisor-based, asynchronous replication solution for vSphere virtual machines. It is fully integrated with VMware vCenter Server and the vSphere Web Client. vSphere Replication delivers flexible, reliable, and cost-efficient replication to enable data protection and disaster recovery for all virtual machines in your environment. vSphere Replication is a deeply integrated VMware vSphere component. It is a robust hypervisor-based virtual machine replication engine. Any changes written to the running virtual machine's virtual disk at the primary site are captured and sent to the secondary site. At the secondary site, the changes are applied to the virtual machine disks of the offline copy (replica) of the virtual machine. vSphere Replication includes an agent built into vSphere and one or more virtual appliances deployed by using vSphere Web Client. The agent tracks and sends changed data from a running virtual machine to a vSphere Replication appliance at a remote site; the appliance then adds the replicated data to the offline replica copy for that virtual machine. The vSphere Replication virtual appliance also manages and monitors the replication process. This gives administrators visibility into virtual machine protection status and the ability to recover virtual machines with a few clicks. Configuring replication for up to 2,000 virtual machines using vSphere Web Client doesn't require a lot of steps: select one or more virtual machines, right-click on a virtual machine, and define the RPO and destination for its replica. vSphere Replication replicates the data to meet the Recovery Point Objective (RPO) at all times, ensuring that virtual machine content never ages past its defined replication policy. RPOs range from 5 minutes to 24 hours and can be configured on a per-virtual machine basis. vSphere Replication can do an initial full synchronization of the source virtual machine and its replica copy. If desired, a seed copy of data can be placed at the destination to minimize the time and bandwidth required for the first replication. A seed copy of a virtual machine consists of a virtual machine disk file that can be positioned at the target location. A seed copy is manually created and placed at the recovery location by using any mechanism the administrator chooses, such as offline copying, FTP, an ISO image, or a virtual machine clone. After the initial full synchronization is complete, vSphere Replication transfers only data that has been altered. The vSphere kernel tracks unique writes to protected virtual machines, identifying and replicating only those blocks that have changed between replication cycles. This keeps network traffic to a minimum and allows for aggressive RPOs. The virtual machine replication process is non-intrusive and takes place independently of the operating system or applications in the virtual machine. It is transparent to protected virtual machines and requires no changes to their configuration or ongoing management.